Do you have dreams that have gone unrealized? You’re afraid of failing, to be powerful, and to really birth what’s within you into this world. 2) a heightened sense of vulnerability. How do you develop these abilities? What if everything was just an experience? What if everything that you engaged in was just an opportunity? It is through our willingness to take a risk, to take a chance, to go for something, to live for a greater reason than we know, that we begin to realize our dreams. And even if that thing isn’t the actual thing, we’ll be guided towards whatever else is. Everything that’s unfolding is unfolding to further support you in cultivating the self-confidence, self-belief and self-nurturing and self-love required to excel at the highest level. 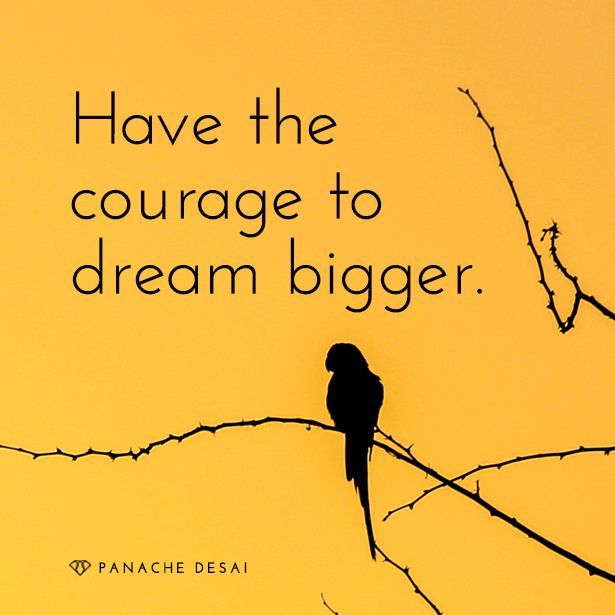 We must have the courage to dream bigger and to never settle for a life that doesn’t fill us with love, with passion and with joy. It will be your willingness to show up over and over again in spite of your fear, that will set everybody that encounters whatever you birth, free. So will you be one of those people that overcome the fear of failure or will you continue to be someone who allows the deepest dream and the deepest possibility that they have within them to die with them? I believe in you. You can’t fail. You will win. Go out and get it! Hi, Sweet Friends. It’s Panache! Often I hear about dreams that have gone unrealized. Pieces of music that have remained unwritten, books that have remained unfinished, expressions that have been wanting to be born into this world that haven’t been allowed to see the light of day. Businesses that never made it past the business plan. There is so much in you that wants to be shared that you are not allowing to be expressed through you at this time, and that’s for one reason and one reason alone… You’re afraid of failing, to be powerful and to really birth what’s within us into this world. There are two things that are required—an ability to risk and a heightened sense of vulnerability. You see my sweet friends, as I see you and as I see your life, there’s no such thing as failure. Everything that’s unfolding is unfolding to further support you in cultivating the self-confidence, self-belief and self-nurturing and self-love required to excel at the highest level. So what if you could never fail? What if failure in truth is never really trying? What if you could actually have a relationship that was loving, even though historically every relationship that you’ve had has led to your heart being broken? What if you could actually be in business for yourself and start to generate exponential amounts of income that far surpass the salary that you’re holding onto out of survival because you believe that if you go out on your own in some way you’ll be jeopardizing what you have. So many of us right now have just given up. We’re just sitting on the sidelines, and not only are we sitting on the sidelines, but we’re filled with a level of resentment about why life hasn’t been the way that we know it could have been. Well I want you to know that as long as you’re breathing, it’s never too late. I want you to know that as long as there’s life, that possibility that’s within you, that authentic contribution that you’ve come here to share, is still alive with you. To those who risk much, much is given. To those who have the courage to go beyond their comfort zone and what’s familiar, the rewards are exponential. The more you risk… The more you put yourself out there… The more you have uncomfortable conversations… The more you put yourself in uncomfortable situations… The more you are joining an elite group of human beings that have absolutely crushed this thing called life. They’ve squeezed everything that life has to offer completely; on their tombstone it says “I did this thing, I lived and I did this thing.” And that’s what I want for you. I want you to share that same level of passion and enthusiasm that those people have, that right now, inspire you, because the only thing that separates you from them is your unwillingness to risk. Your fear of failure is keeping you from success. Your fear of failure is keeping you from love, intimacy and connection. Your fear of failure is keeping you from starting a family. Your fear of failure is keeping you from financial prosperity and increase. It is your fear of failure that is inhibiting your creativity. It is your fear of failure that is single handedly robbing you of the aliveness that is your birth right. So what would you do if you couldn’t fail? I want you to right now grab a pen and piece of paper and I want you to write a list of things or experiences that you would have if you couldn’t fail. I want you to begin to dream again. I want you to begin to even tap into the possibility of what your life would be like if fear or fear of failure wasn’t even an option. If it was no longer on the table. You know there are so many people that have lived historically that we call geniuses that failed over and over and over again. So were they really geniuses? Or were they just stubborn when it came to their vision and the implementation of their vision? And for most of them, when they first shared what it was that they wanted to birth into this world, they were ridiculed. They were met with opposition. People laughed at them and eventually over time because they were so steadfast in their belief and their passion and their commitment to what they wanted to birth… Little by little, their breakthroughs and their innovations, became mainstream, to the point now today we take them for granted. It is my deepest wish that you won’t allow your music to die with you. It is my deepest wish that you won’t allow that book that remains unwritten to die with you. It is my deepest wish that you won’t allow past failed relationships to keep you from the love and intimacy that I know is available to you because you’re adorable, because you are worthy of it. It is my deepest wish that you won’t hold past financial failures as a measure of how life is going to unfold financially for you. Risk greatly, dare greatly, be vulnerable and allow yourself to attract greater possibilities into your experience than you could ever imagine.